Cats can be not only good little buddies, but also good entertainment. That is, if you pay attention and take time to interact with them. This funny story took place because I paid attention and took a moment to interact with our cat, Clyde, at just the right time. We were living in a small, two-story frame house on Snyder Hill, just outside of Ithaca, in the Finger Lakes Region of upstate NY. One lazy Saturday afternoon, shortly after we had returned from shopping and were unloading our shopping bags in the appropriate rooms, I lingered for a moment, in the small upstairs bedroom at the end of the hallway, to put away some of the spoils of our shopping spree. Then I heard behind me the familiar sound of “someone” rattling a paper shopping bag that, innocently, I had left on the floor. So, I turned to see exactly what I expected to see: Clyde was in the bag poking and scratching mischievously at the sides, just to hear the mysterious noise it made when he struck it. Now, this happened not to be your ordinary, run-of-the-mill paper grocery bag; this one had those paper loops at the top which served as handles for ease of toting. Ignoring the handles for the moment, I began to playfully poke and scratch at the bag from the outside, also mischievously, to see if I could spook the cat and get in on the fun. Well, it wasn’t long before Clyde became so spooked by (what must have seemed to him as) the bag poking and scratching back, that he panicked and burst suddenly out of the bag at breakneck speed in order to escape the “bag monster” within. Problem was, he was ignoring the handles on the bag as much as I was. Until, that is, it became evident that in exiting the bag in a panic, he had accidentally put his head through one of the handles and was dragging the bag ever so close behind him. When he heard the noise of the bag behind him, he looked back in full stride to see what was making the noise and saw that the bag was actually chasing him! This discovery put a sudden look of terror on his face, and he kicked it into high gear. I had no idea he could even run that fast. By this time I was beginning to laugh uncontrollably, as compassion for my little buddy had not yet kicked in. Out the doorway and down the hallway he bolted, with the ensnared bag keeping pace with every leap and bound he made. Just then (after I had had my jollies, that is) my heart became flooded with compassion, and I ran after him to free him of the “bag monster.” Of course, this just added to his panic attack, because now he had both a “bag monster” and a “giant monster” chasing him! So, he went into overdrive. Turning the corner, he raced down the stairs at lightning speed, banged into the closet door at the bottom, turned left and began making circles through the living room, the dining room, the kitchen, the living room again, etc. I was hopelessly chasing behind him, desperately trying to grasp the bag from behind and set him free (By the way, have you ever chased behind a paper bag moving at ~ 10 MPH, stooping forward every second or two to grasp the bottom of the bag with one hand, while laughing uncontrollably? I think not. Well, I can assure you, it’s no easy task!). Fortunately, Clyde began to tire out, and I was finally able to get control of the bag, and, with expert precision, extract his head from the handle. Now, I’m sure he was thankful later that I had rescued him from the “bag monster”, but his immediate reaction was to run from both the bag and me as fast as he could go, the little ingrate! 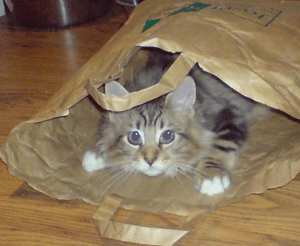 This entry was posted in True Tales and tagged bag, cat, Finger Lakes, funny story, Humor, Ithaca, laugh, monster, New York, panic, Paper bag, Shopping bag, spook, tale, terror.